Newton City Hall is located at 101 West 4th Street South, Newton, IA 50208; phone: 641-792-2787. Photo: August H. Bergman House, ca. 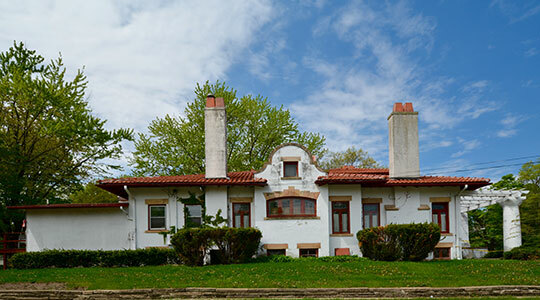 1909, 629 First Avenue East, Newton, IA. Listed on the National Register of Historic Places in 1989. Photographed by User:Boscophotos (own work), 2016, [cc-by-3.0 (creativecommons.org/licenses/by/3.0)], via Wikimedia Commons, accessed May, 2016. Newton was settled in 1843, the same year as the City of Des Moines. Newton was founded in 1850 and incorporated as a city in 1857. Settlement was stimulated by the federal government signing an Indian Treaty the previous year. Adam Tool and William Highland, John Frost and John Vance were the first four men to reside in Newton. Tool and Highland each staked out a 320-acre land claim, while Frost and Vance remained, awaiting an expected wagon load of previsions. Before Tool's home on his claim was completed, he was being asked for room and board by numerous incoming settlers and westward travelers. Tool took advantage of the demand and become a tavern keeper. In 1846, some months before Iowa became the nation's 29th state, Jasper County was established. Both Newton and Jasper County were named after Revolutionary War sergeants who served under General Francis Marion. In the 1880's settlers came to the area via the Mississippi and Missouri Rivers bringing tools and products from the east. This stimulated further settlement. Most settlers of the area were farmers, while a smaller number started businesses to serve the farming community. By 1880, the growth in the rural area around Newton began to slow substantially. All of the land in the surrounding area worth farming was in use. At this time manufacturing began to play a larger role in Newton's economy. F.L Maytag came to Iowa as a small farm boy in a covered wagon. He, along with three associates, started the Maytag Company. The original product was not washing machines, but automatic self-feeders and band cutters for threshers. The four men equipped with $2,400 in capital, a workable idea, and an abundance of confidence in the future laid a foundation for the Maytag home laundry appliance company. The first Maytag washer was made in 1907 as a sideline to the farm equipment line called the "Pastime" washer. From 1900 to 1930, Newton's population grew erratically. Industrial growth coupled with favorable farm prices made Newton a very attractive community in which to settle. By 1925, a phenomenal industrial boom was being felt by the City. Workers poured into Newton, rent and real estate skyrocketed, and the cost of living soared higher and higher. From 1925 to 1929, three million dollars was spent in the building of homes. Most of the homes were modest cottages built for incoming workers and were located along Highway 6. Then in 1929, Newton was hit hard by the depression and the population declined by over ten percent between 1930 and 1940. Following World War II, Newton's economy recovered quickly as the Maytag Company prospered. Production could not keep up with demand. People continued to relocate in Newton as the success of Maytag encouraged other manufacturing companies to set up their operation in town. The population continued to grow at an average annual rate of 2 percent between 1940 and 1970. Since this time growth has stabilized and until recently Newton was able to rely heavily on its manufacturing. In October 2007 the City lost its bedrock employer, Maytag, putting thousands out of work and leaving 450,000 square feet of office and 1 million square feet of manufacturing space vacant. In the wake of Maytag's departure, the City has responded in innovative ways to expand and diversify its tax base so that it no longer relies on one major employer. Council Draft, Newton's Future: A Comprehensive Plan, 2012, http://newtonsfuture.files.wordpress.com, accessed July, 2014.